In the spring, this plant exploded with soft, fragrant new leaves. I'm now regretting that I didn't cut any of them to dry. I wanted to set some aside for our Thanksgiving dinner. But since the plant grew so effortlessly and rapidly, I didn't feel any urgency to harvest the leaves. I thought they would be here. All. Summer. Long. My sage plant on April 25, 2007 -- Alive! So what's going on with it? The leaves are wilting and curling and turning crispy brown. I think the plant had plenty of water. Could it be too much water causing this? Is it going the way of our rosemary? As it got closer to summer, I moved my sage out of direct sunlight to a part of my porch that only gets partial sun. The plants have been thriving since the move. I live in memphis, and this happened to my sage, as well, but I chalked it up to old age. Only part of it died, and that was after it spent early spring covered in blossoms and bees. It was a piece of a 6 year old plant that had been in its current location for 3 years. What survived is still going great guns. I've been reading a book called "It's a Long Road to a Tomato" and actually read about growing herbs this morning - sage, rosemary and thyme apparently do like drier soil than herbs like parsley and basil do. My thyme has the same affliction. The common thyme is ok, but the scented and variegated ones all seem to have this same illness :( When you find out what it is I would love to know. Based on your description, and my understanding of the hot, wet DC summer weather, I think it has had too much water. It looks like the roots may have rotted. 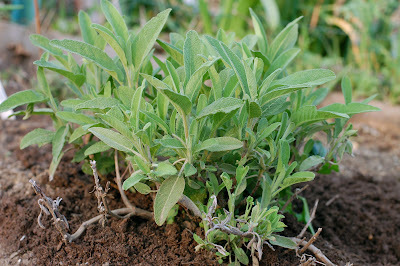 Sage grows wild on hot, rocky hillsides, so you can imagine how little water it needs to be happy. Our sage just did the same thing! We've had torrents of rain this season in Fort Worth but it didn't bother it until last week...BUT at the same time the dog decided to use the herb garden for a potty stop...so unsure what did it in. While its true that the original Salvia officinalis grows on rocky hillsides in Southern Europe without much water these are garden cultivars that have been nursery grown for a few generations and I think have adapted to the more urbane existence and the extra water that comes with it. I'm leaning towards the dog taking out the Sage in our garden. Thank you for your input on this. Now that I think about it more, it might have something to do with where I placed the tomato plants this year. They are on the western side of the herbs bed and they've grown so tall that they're now casting shade in the afternoon where the sage is planted. The soil is probably holding moisture longer because of the shade. Anyway, that is my guess, based on making some more observations today. Ed, your plant that you have in partial sun... is it in fairly dry ground? Or in a pot? We don't have dogs coming through the plot, so fortunately I can rule that one out. Sorry that happened to you, Steve! Oh, I'm so sorry about your sage. Mine is thriving in full sun in Savannah, so I doubt too much sun is the problem. Mine's also growing in a bed with VERY good drainage, actually in very sandy soil. I hope you can salvage it. I adore my sage plant. It goes through wilting stages but I just cut off a bunch of branches and it seems to thrive all over again. In fact, it is the one plant I plan to dig up and take with me when we move:). I suspect the problem has to do with too much moisture and humidity. I had the same sort of thing happen to a lavender, which essentially needs the same sort of soil, heat and light conditions. 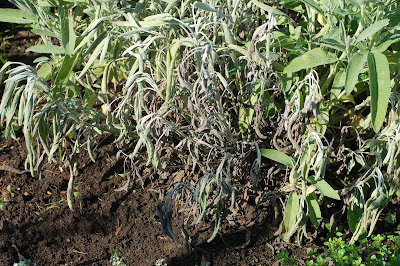 You've probably looked at it pretty closely, but it might be worthwhile to see if there are spider mites or some other small critter that is causing havoc with the sage. Could you have an attack of sage leafhopper? It looks to me too much watering. I have been watering my Herbs in the mornings and evenings but they haven't had a good soaking in a long time. Herbs do need to dry out a bit before then need to be watered again. Oh, no. I didn't even think it could be some kind of bug causing this. Some of the leaves do have the mottling that's shown in the photo on that link you sent me, Soilman. And spider mites? I hope it is just a moisture issue and not an insect infestation. I'll have to inspect the plant a little more closely next time I'm out. Hey, we've all killed our share of plants with kindness but it doesn't lessen the blow does it! Give it another try.